Do you need a tutorial on sidewalk chalk paint? Check out this one here that I’ve done – it is really easy and you probably have all of the supplies on hand already. Here in the Chicago area, summertime can be brutally hot. Taking full day trips somewhere for fun can feel like a total chore and I hate getting all packed up just to get there and spend a short time because it’s so hot. We always have sidewalk chalk on hand for the kids. 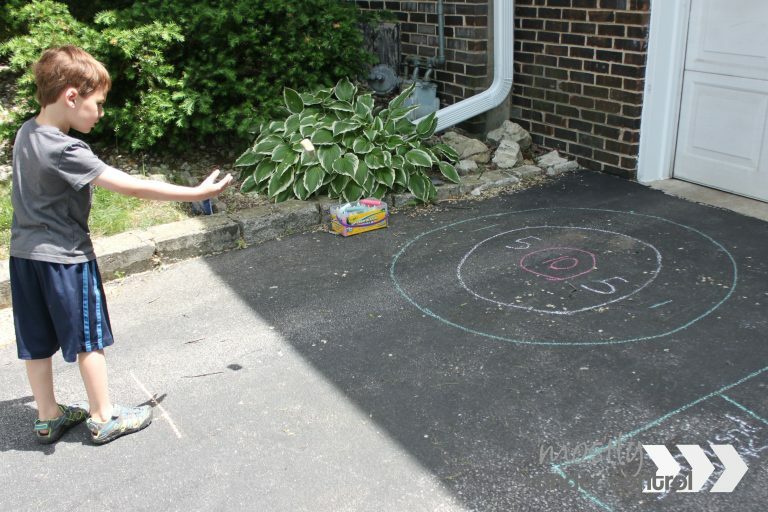 They can draw whatever they like and can also create games with the sidewalk chalk while playing. It keeps their brains active during summer months and gives me a chance to sit in the grass while they play safely right in front of the house or on the driveway. We’ve even done them on the back deck. 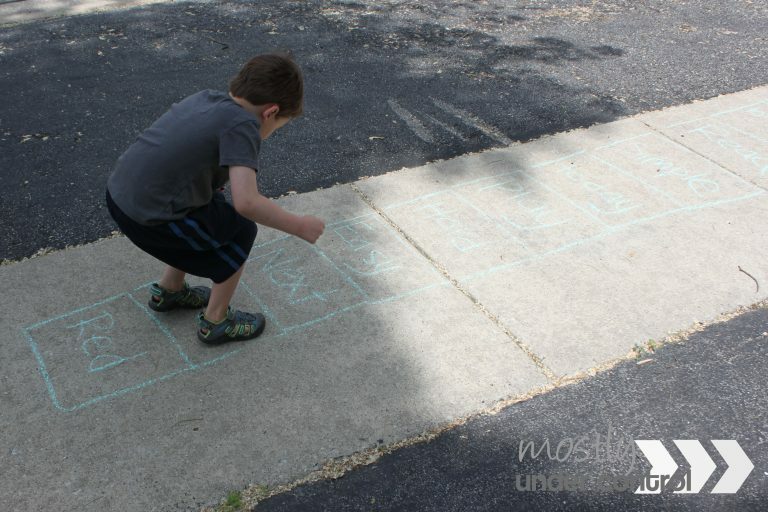 I put together a list of a few sidewalk chalk games we like to do outside and of course they’re adaptable for all ages (my kids are almost 6 and almost 3). 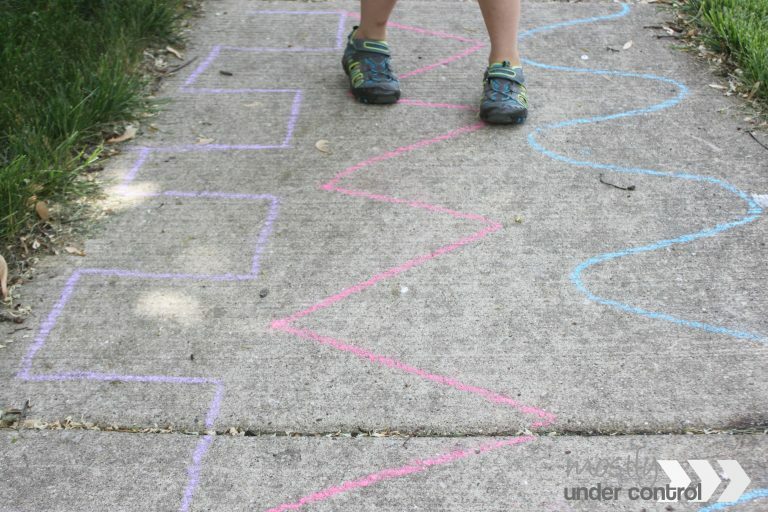 Follow the Lines: Create different length lines down the sidewalk or driveway and have your kiddos follow the lines. My oldest is practicing his writing skills by making the lines and my youngest is working on following directions and being aware of her body. Bean bag toss: Set up a target (come on, we all know what that looks like 😉 ) and write point amounts in each section. Hand your kids some bean bags, rocks, etc and toss away. This works on math, taking turns, large motor, etc. You can keep score on the ground right next to it! Scavenger Hunt: Write down a few items they might find in the yard with a circle under it. Have them run through the yard to find the items and drop them into the circle. 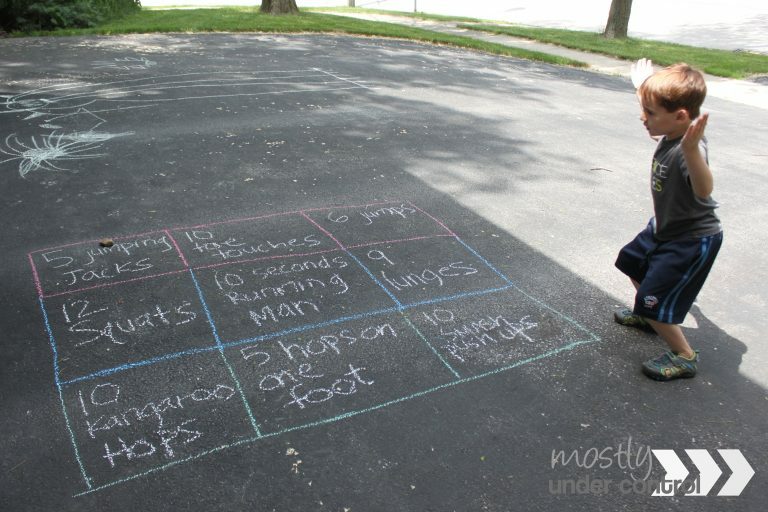 Sight Word Hopscotch: This is more for the older kiddos. You can set up a hopscotch board and instead of numbers, add sight words. This works on sight words, large motor play, taking turns, etc. Are you doing these activities! Head over to Instagram and tag me! You might get featured on my account! @mostlyundercontrol.